With the 2017 Rugby League World Cup having gotten underway in earnest on Friday morning UK time with what is possibly the ultimate match up of Australia vs England, it’ll likely be the knockout stages before we see the truly epic encounters come round again. England gave a good account of themselves and were unfortunate to be on the receiving end of another, all too familiar defeat to the old enemy from down under. For those who don’t appreciate the tough, athletic, skilled sheer brutality of a sport which over here garners less and less media attention year on year, we thought we’d pay a little tribute to just some of the toughest antipodean men ever to cross the whitewash, that’ll hopefully see you tune in to what’s set to be a seriously entertaining tournament. Strap yourselves in, these men of steel know a thing or two about never taking a backward step. This guy loved a tear up so much he even released a song dedicated to the ‘biff,’ as the Aussies refer to a good scrap, called ‘Harden Up’ and yes no one liked to tear it up quite as much as Tommy. At 5’7′ he was far from the biggest, but this pocket halfback terrorised his opposite number and forwards alike with his steadfast refusal to accept defeat. He represented Australia on 29 occasions in Tests and World Cups in an era that was defined by a bloody brutality the like of which we’ll never see again. There were some seriously big hard men around in ‘Terrific’ Tommy’s day and the fact that he’s so highly regarded by those very same peers, tells you everything you need to know about his standing in the game – this guy wouldn’t take a backwards step if you hit him with a cattle prod. There’s tough, then there’s Gorden Tallis tough, the 6’2 second row forward wasn’t nicknamed “The Raging Bull” by accident. Tallis had a feared reputation on the pitch, quickly making a name for himself with his brand of ruthless aggression playing for Queensland’s St. George Dragons. In 97′ he moved to the Brisbane Broncos where he dominated all the competition he faced. He represented his country but was perhaps at his fiercest when stepping up for his native Queensland in the often brutal State of Origin matches. Certainly not shy of a dust-up, which Wigan’s Terry O’ Connor and the Panther’s player Ben Ross will definitely both attest to, Tallis will as much be remembered for his bruising tackles, with this one in game 3 of the 2002 origin match being, in our opinion, one of the greatest in history. Kiwi forward Broadhurst was a true battler known for being tough as old boots. Not a stranger to a red coloured card this New Zealand enforcer, who played 17 times for his country often let his fists do the talking. If there was a scrap taking place on the field of play, and Broadhurst was still on it you could safely put your money on him being involved, no surprise that he was a top amateur boxer in his day. He most notably played for Manly and Illawarra before moving to the UK to play for Hull Kingston Rovers. 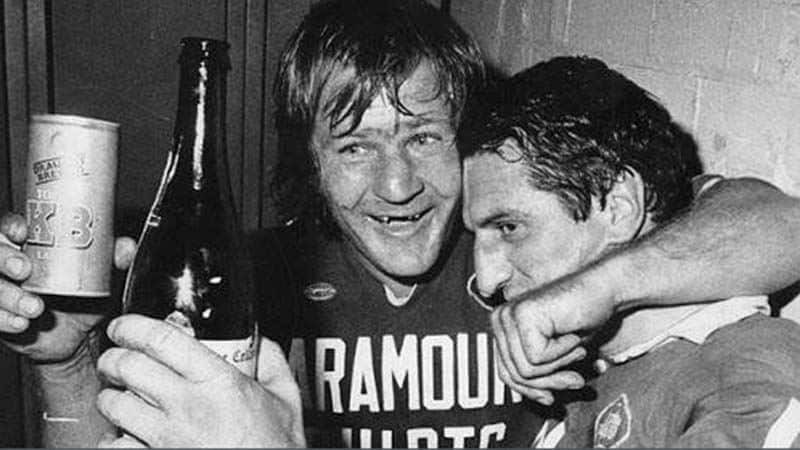 The scrap in the 1981 match we showed above when writing about Tommy Raudonokis, between his Manly-Warringah side and Newtown at Sydney cricket ground, was pretty much the height of the “biff.” This Sydney RL Finals punch up involving nearly every player was the rugby brawl to end all. Bare in mind Broadhurst had both cheekbones broken and an eye completely closed after the fight, yet played the whole match. Shane Webcke was the one club man who ran out for the Brisbane Broncos on 254 occasions, he also represented Australia in 18 tests and was considered one of the finest front rowers to have played the game. Despite this deserved recognition, Webcke also forged a reputation as being one of the toughest players out there. A bit foolish? Or put yourself through immeasurable, unnecessary pain, fair play Shane Webcke – something tells us this guy would have run through brick walls just to see if he could run through brick walls. Renowned enforcer Ian Roberts is up there as one of the hardest men to have played the game, he was also incredibly brave, being the first professional rugby player to come out as gay in 1995. On the pitch he was a ferocious presence, going into tackles like the proverbial steam train. He also enjoyed a good punch up, in fact, he loved to throw fists, by all accounts he’d of probably thrown the kitchen sink had it been to hand. One such infamous occasion saw Ian Roberts take Balmain Tigers full back Garry Jack to task, well he punched ten bells of sh*te out of him. It was an incident that was to have further repercussions as Jack sued Roberts and took him to court many years later, with a hefty settlement being agreed. Known for having an incredible engine, and astonishing tackle rate, his relentless attitude saw him regarded as one of the great front rowers in the game. He represented Australia on numerous occasions and made nine appearances for the New South Wales State of Origin team. Not a guy you’d want sizing you up across the pitch! 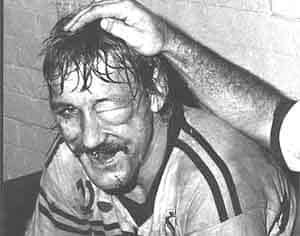 Ah, John Sattler, the man who famously played practically the entire 1970 grand final with a jaw broken in four places, a man rightly regarded by many aficionados as the hardest rugby league player ever to take to the field. Known as “Gentleman John” for his softly spoken persona off the pitch which belied his ferocious approach on it, he led South Sydney Rabbitohs to four Premiership titles between 1967 and 1971. Sattler hung around at the final whistle to lift the famous trophy, make an acceptance speech, before heading off to the hospital for treatment – he would spend three months recovering. John Sattler, we salute you, this man was as tough as an old pair of boots that have been frozen in ice. The 60s, 70s and 80s remain what was the golden era of Australian Rugby League, certainly when we’re talking about these brutal encounters. The modern players are a different beast, incredibly fit, athletic and strong and there’s no doubt that the hits are as hard, if not harder than ever. But those past times represent a memorable period in time when as many fists were flung as trys scored. Of course, there are still plenty of enforcers around these days, Justin Poore springs to mind, having finished his career in England. He certainly wasn’t backwards in coming forwards, and Britain’s Sam Burgess in many ways emulated the great John Sattler with his very own heroics in the 2014 Grand Final for the very same Rabbitohs. One thing’s for certain, whoever lifts the World Cup in Brisbane on December 2nd, will certainly require a team of very tough men to do so.